I want to dispel a myth. Arguably the greatest accusation of laziness levelled against mankind is unjust and unfair. And when I say “mankind” I mean mankind, and not womankind – as it is womankind who have levelled the accusation. Blokes are accused, to the point of boredom, of leaving the toilet seat up after use. Well, yesterday it struck me that there is a genuine reason for this – and I stand up for mankind on this issue of national, if not global, importance. My 6 year old son goes peepee. We have been encouraging him since the age of about 3 to go peepee – when he feels he needs to, and to go on his own, and to wipe himself etc etc. So he does. He goes peepee. He lifts the seat up – after all you would not want him to pee on the seat, so good boy, lift the seat up. Then he goes peepee. Then he has a little wipe. Then he washes his hands – very good boy. Now he does not have the strength nor the reach to flush. But hey, the boy done good. And he leaves the toilet. And so the boy grows up, through his formative years, being taught, and indeed rewarded, with leaving the toilet up. We aim to please - would you aim too, please? So, to do what womankind would prefer, requires a complete re-training of this nurtured behaviour. Some manage that. Some do not. Some do not know why we have to change. 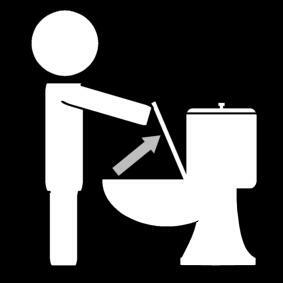 After all, boys – men – need the toilet seat up to do weewee (the adult form of peepee), whereas women need it down. But us men don’t get all hot under the collar and complain that women leave the toilet seat down, so we have to lift it up. We simply get on with our lives – after all we wouldn’t want to miss a contentious throw-in in the footy match in the lounge – or worse still, lose control over the remote control!